Renowned for their signature chime and sparkle, guitarists have been enjoying Vox amplifiers for nearly 60 years. From bands like the Rolling Stones to The Beatles and Radiohead, that famous sound features on some of the world’s greatest records. 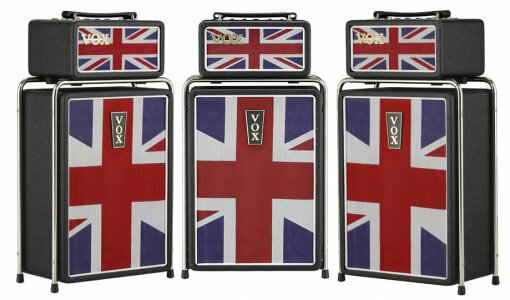 So, the announcement that Vox has released a set of new amps is music to our ears. While Brexit Britain continues to occupy most of the population, Vox reveals a Union Jack decorated Mini Super Beetle. The style, which is sure to get the most impassioned patriot swooning with pride, is a nod to the classic tones and records of rock ‘n’ roll’s golden era. Particularly those excellent sounds coming out of London and Liverpool at the time. The specs of the amp are the same as the regular Mini Super Beetle. Featuring Nutube technology it still retains the tone of a classic British amp but with the addition of modern quality and versatility. Plus, its high performing Celestion speaker delivers further clarity, sealing that unique Vox vibe. Next up are the new VX50 GTV and VX15 GT amps. They feature Vox’s Virtual Element Technology and provide several accurate and authentic amp tones. Included is the classic Vox AC30, of course, as well as a further ten classic and modern models. Plus, you can enjoy a wide range of effects, including modulation, tremolo, delay, reverb and more. If you’re in need of more fire-power than the VX15‘s 15-watts, the VX50 will see you right. Featuring a next-generation Nutube vacuum tube, it gives you the distortion and sense of compression you’d expect in a regular vacuum tube, but without the maintenance or high cost. Furthermore, the VX50 includes a USB interface that lets you connect directly to your computer for recording. And finally, we have the Vox AC15HW1 G12C and Vox AC15C1 G12C. Based on the same classic model that guitarists worldwide have used to get that classic British tone, these limited-edition combos feature the inclusion of a handmade speaker. This combination delivers a punchy, low-end response with bags of dynamics and an articulate top end. Although the two combos are similar and feature the usual twin channel design and speaker, the AC15HW1 G12C is hand-wired at Vox’s Kentucky headquarters. This gives the amp incredible reliability when compared those that use printed circuit boards. Plus, you know that any future modifications can be dealt with quickly and easily.